I found this information on the MidlandUSA website and it was helpful to me. I looked at the MicroMobile on the midland website, they offer some higher power units that could have better transmission than traditional CB radios, but are they really better? I would say they are a large step above CB for many reasons. My preferred mode of communication is VHF on the 2-meter amateur band, but I do have a GMRS license and a few radios. They both have their place. First off, understand that a ham radio is created with the Amateur Radio enthusiast in mind, i.e. they are not "Fire and Forget" like a CB is; there are added features and capabilities with that in mind. As such, the market truly has diverse offerings, but they all will require programming to some degree. A GMRS radio is pretty much "set it and forget it" much like a CB radio is with the biggest operating difference being that you can set "privacy" tones and codes on them. There are also GMRS repeaters out there, but they are not nearly as prolific as ham radio repeaters and most are privately owned vice club-owned like ham repeaters. Another thing to look at is antenna height and ground plane. The antenna height is directly proportionate to the frequency of the signal. This is why a quarter wave antenna for CB is 8.5 feet and GMRS is .5 feet. You also need that much ground plane on each side of the quarter wave antenna which is one reason why Cb work kinda screwy. Also, water intrusion into the cable is a very common problem with a lot of CB installs I have seen. As far as sound quality is concerned, GMRS is on FM, CB is on AM. Flip your car radio from an FM station to an AM station and you will get the idea. Range on GMRS, I did a side by side test with a friend comparing the range of 2m Ham VHF compared to 70cm Ham UHF (70cm is close to GMRS in frequency and their propagation is nearly identical). When I say side by side test, both of our ham radios have dual radios in them. The test was literally done under identical conditions simultaneously with VHF on one side and UHF on the other side with the same equipment. The topography was mixed suburban and interstate with rolling hills and a few deep valleys in Augusta. We managed 8 miles reliably on VHF and 5 miles on UHF. So do they have GMRS handheld radios? It sounds like rather than trying to get everyone in the club to take the exam, that these GMRS radios would be a better option and they could just buy the license. The license-free hand helds are limited to 2 watts on channels 1-7 and 15-22 while channels 8-14 are limited to 0.5 watts. They will only get a mile of range at best. Also, GMRS does not require an exam, just a $70 fee for ten years per family. Amateur Radio requires the exam and the fee is up to $15 per individual for 10 years. On a side note, the FCC does not collect the fee for Amateur licenses, rather the (501C) club that administers the exam keeps the fee. Here is a good video explaining GMRS a bit more. Here is another video that does a damn fine job of explaining the differences between CB, GMRS/FRS and Amatuer and how it relates to Jeep use. My suggestion would be to pick a frequency and a Tone and stay with it...That way commercial gear could be used, as its not field programmable. 45-50 watt radios can be had for CHEAP. Here is a review that I was reading about some of the Midland radios I was looking at. Tripp, can you decode this. How can we avoid these problems. .0 out of 5 starsMisleading and gimmicky product designed to sell and not work well. This is a misleading and poorly engineered product. Allow me to explain. If you are looking for the legal way to communicate with more or less decent range you have very few options. 1. FRS does not require a license but is limited to 500mA (as of today; FCC is implementing changes to allow up to 2W of power on all current FRS channels, including those shared with GMRS). 2. MURS - it's VHF, also unlicensed, with 2W power limit. There are very few MURS certified radios on the market and VHF may present other issues with range. 3. GMRS. You need to get a license from FCC for the modest fee and then you can transmit up to 50 watts on simplex and repeater GMRS channels. You also need GMRS type-approved radio to use these channels legally. So it seems GMRS is the obvious way to go. Here where the problem begins. There are very few high power (>4W) handheld GMRS approved handheld radios on the market (and none that support repeater frequencies). There were a few high quality commercial Part 90 radios that were also certified for 95a (GMRS) but those are discontinued long time ago. The product in question is one of the few ones that produces honest 5 watts - confirmed on FCC web site by looking up FCC ID and relevant lab measurement reports. Sounds great on paper. So after much research and digging through FCC filings and test data I bough it. 1. Setup of the privacy codes on the first 22 channels is simple enough. 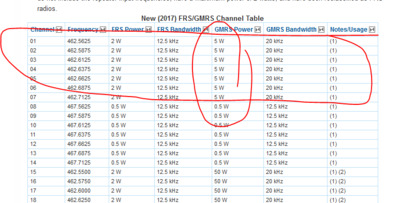 What are the rest of the advertised 50 channels there is no description, but you can find discussion online: Apparently these are the same frequencies (have to be - there are only so many GMRS/FRS frequencies allocated) with pre-set privacy codes. No word about what codes and what frequencies in the user manual. It's a gimmick feature to show "more channels" than the competitors and likely those will work with other Midland radios out of the box. I don't like such marketing stunts - but whatever. Not a big deal. 2. Receiver is very noisy. Much noisier than my other commercial handheld's one. This will limit useful range by raising noise floor. Not good. 3. Radio seems to indeed transmit 5 watts with fairly decent range (comparable with that of my other real part 90 5W transceiver). But only when using included battery pack. This is crucial "but" never mentioned anywhere. The battery pack is 5 NiMH AAA rechargeables sealed together. (Note - 5, not 4). Unfortunately the capacity of the pack is 700mAh and according to my measurements the radio consumes average of 42 mA in standby with display off. This makes it only last for 16 hours if you don't transmit (it lasted only 8 hours in my test). Not much at all. What makes it worse - charge time is 12 hours (charging current was well under 150mA). And no, you cannot charge (spare) battery pack while using the other one - it must be charged while in the radio. What's even worse - they include automotive charger in the box - implying that you can quickly recharge the units while driving. Who is driving for 12 hour straight!? This is absolutely useless and misleading feature. So in the current form the radio is unusable for a long backpacking trips - unless you buy charge and bring extra battery packs - 2 per radio per day. 4. But wait you say - you can power the radio with AA batteries!. Yep. Sort of. You can put 4 (not five) AA batteries. And this would of course provide radio with less voltage. Perhaps they engineered it well to properly work on a range of input voltages? Nope. Using AA batteries (or AA NiMH rechargeables) reduces output power to about 2.0 - 2.5 watts. There is no indication of that happening (except the reduced range, and current consumption - which I measured) - the display still shows "H" for high power. And it is not mentioned anywhere in the documentation (or I overlooked the fine print somewhere). This way you get very log battery life - you can find AA batteries with capacities well over 2000mAh - but now the feature you bough the units for and that is advertised in huge letters - 5W output -- does not apply anymore. You got noisy, weak set of walkie-talkies. 1. Unusable battery life - you either use battery pack with very short life and get your 5W transmit power or use batteries and get 2W. 2. Noisy receiver - limits range by increasing noise floor. 3. Unacceptably long charging time - 12 hours. Included car adapter is therefore useless and is pure gimmick feature. 4. Bogus channels 28 channels (after official 22 FRS+GMRS ones) with unknown frequencies or programming that cannot be changed. Another gimmick. I'm very unhappy with this product. It feels it was made to sell well rather than to work well. I reached out to Midland with questions but they did not respond to me. These list the frequency as UHF, At the meeting last night we mostly discussed FRS/GMRS radios. How does the UHF play into this? They're a bit better, IMHO, than the UV5s. I also got the USB programming cable and use a free PC app called CHIRP to program them to use whatever VHF or UHF frequency I want. This is infinitely easier than programming them through their keyboard, which is a genuine PITA. I do have a HAM license from way back when you had to build a radio before you could use it..... Truth of the matter today is that unless you're being some sort of nuisance and enough people report you to the FCC, noone cares.... specially in the GMRS and MURS spectrums. Yes, these radios are technically not legal for anything but HAM... but again, noone cares. These archaic regs were made to keep poorly built radios for bleeding all over the band... Modern software-driven radios don't do that. When dealing with modern gear, there is no way anyone, including the FCC, can tell the difference by listening between a type-accepted radio and one, such as the Baofeng, that isn't. My advice: buy whatever you want and do whatever you want as long as you're not being a jerk on the air. Noone cares. Get a HAM license if you have the time and/or inclination-- its a fun learning process and pretty easy since they dropped morse code. Or not. The GMRS license is a waste of money. The FCC has all but conceded this point... noone gets one and noone cares. For your specific needs, I would get some UV82s and hook them up to the GMRS repeaters. 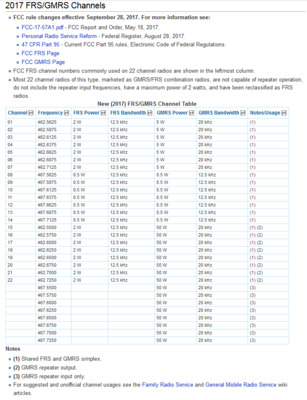 I have a CHIRP file I can send you that has every useful frequency you could possibly want -- 101 channels in total covering all the "pertinent" bands such as FRS, GMRS, MURS, Marine, Weather, etc which will give you maximum flexibility...... It literally takes seconds to download it to the radio via the USB cable. This will cover everything but CB which is AM and therefore requires different hardware. I think my takeaway from this is we want to make sure that we get a GMRS license and then we need to ensure that our radios are capable of using the 5W channels 1-7. This would give us more than twice the power of the FRS radios and keep us legal. 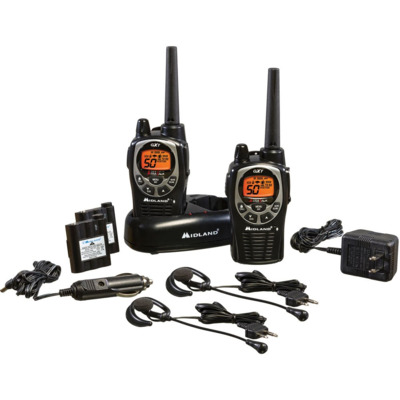 My question is, should we go to the BaoFeng UV-5R or UV-82 style radios and be marginally FCC incompliant? or choose standard FRS/GMRS hand helds? Just applied for my GMRS license. Not sure how long it takes to process. TK-830's run for about 100 bucks on e-bay. The last time I got a GMRS license, it was in the ULS the next day. My apologies to Bill Collins, my phone died shortly after I responded to his first message. 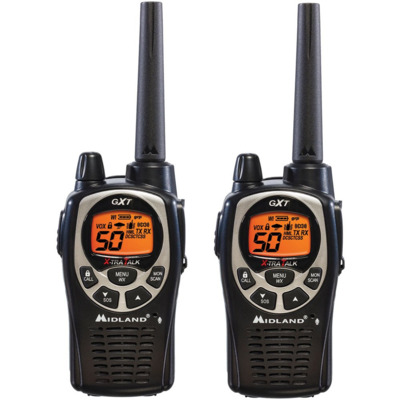 Anyway, the Midland radios are Part 95 certified meaning they are compliant with FCC regs for GMRS radios. The Baofeng UV-5Rs are FCC Part 90 certified. Programming a Part 90 certified radio for use on GMRS is a very common and accepted practice, hence Tripp's post above with the used Kenwoods available on e-bay. Also, you can upgrade the antenna https://www.amazon.com/Authentic-NA...uv-5r+antenna&qid=1555436754&s=gateway&sr=8-3 and even hook it up to an external antenna whereas the Midlands you are restricted to fixed antennas. The UV-5R can also be programmed with repeater offsets. FYI, Midland has a 20% off coupon code "OverlandUSA" that is current if you order from their website. Hold the phone....May have an option to use UHV/VHF as a club or as a member of OffroadSC.com. Researching now.